The Royal Australian Navy frigate, HMAS PARRAMATTA, and Royal Saudi Naval Force Ship, RSNF AL-TAIF, rendezvoused in the Southern Red Sea to conduct a co-ordinated transit, Jan.20. 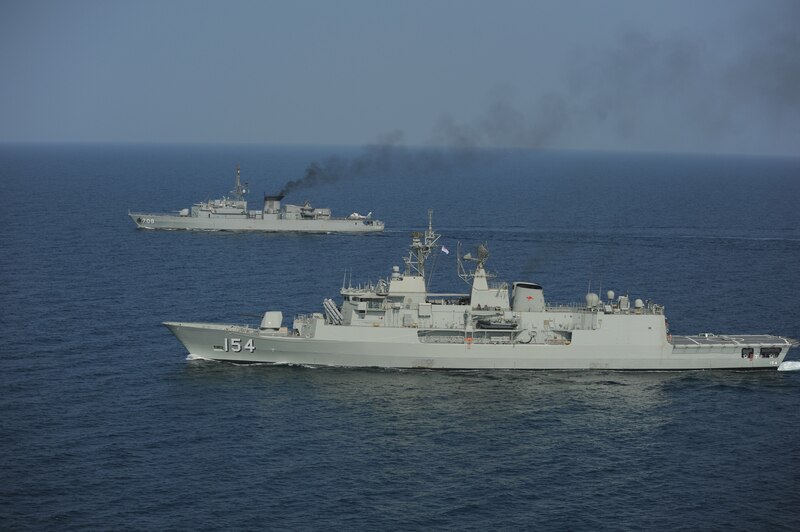 The two ships are both operating with Combined Task Force (CTF) 150 (maritime counter terrorism), part of the Combined Maritime Forces (CMF) that patrols the Red Sea, Gulf of Aden, Indian Ocean and the Gulf of Oman. “HMAS PARRAMATTA and RSNF AL-TAIF conducted a variety of coordinated activities during the four hour interaction. The transit was easily coordinated, and both ships reported that they worked together with ease,” he said. The aim of these recent coordinated transits amongst coalition forces is to promote greater regional participation in maritime security in the Southern Red Sea, Gulf of Aden and Gulf of Oman, as well as the Arabian Sea. HMAS PARRAMATTA departed Sydney on Sept. 26, 2011, and is currently undertaking her fourth deployment to the Middle East. In the past PARRAMATTA has conducted maritime security operations in the Gulf region and the Horn of Africa, as well as counter-piracy and anti-smuggling operations in the Gulf of Aden; and supported counter-terrorism activities.